Dana Lynn Barbar | 9/12/2017, 4:45 p.m.
Portland Community College is providing classroom space for McCoy Academy, saving a future for the non-profit private high school serving underserved students in Portland since 1988. The McCoy Academy is back and better than ever! The alternative school for underserved and disenfranchised youth has found a second home with Portland Community College’s Cascade Campus in north Portland. Originally located on Northeast Martin Luther King Jr. Boulevard, the academy faced financial struggles when they lost their lease to a building that was sold and demolished to make way for condominiums. The school’s founder and executive director, Rebecca Black, strived to obtain the funds necessary to stay, but could not raise enough and the academy was forced out in June. Now the school has the fortunate opportunity to continue on with PCC. Part of the nonprofit Oregon Outreach, McCoy Academy had already built a relationship with the college over 25 years. After the loss of property, however, Dr. Karin Edwards, president of the PCC Cascade Campus, helped with an initiative to create a space for McCoy within the college. From there, Black worked with Rakeem Washington, who directs the Opening Doors Grant, a juvenile justice educational reentry program at PCC. 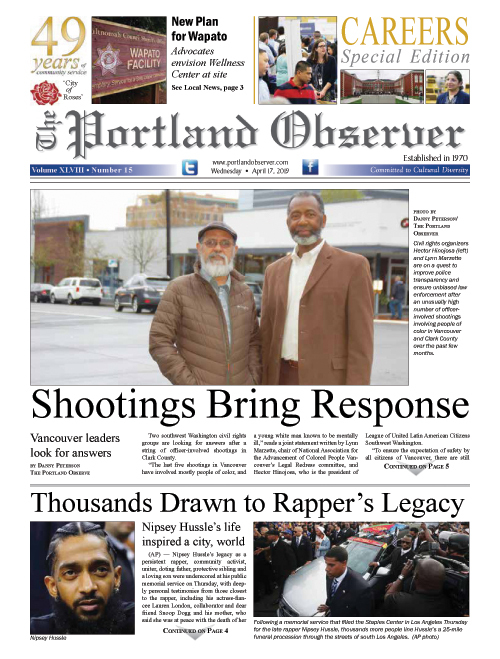 Washington also serves as Executive Director for the Portland Observer. Part of McCoy’s diverse student population benefits from the Opening Doors program. Together, PCC and the alternative school found a way to keep McCoy active by offering classroom space and enrollment options at the college. The students’ first day of classes was Monday. The students are now provided with the chance to earn college credits, as well as a chance to acclimate to a college campus, which is more than they received at the previous location. Katie Carpenter, assistant executive director of Oregon Outreach, plans to implement a new program for adults to obtain a G.E.D., which can be housed at the office site now that the students are at the college campus. Black and Carpenter are thrilled that McCoy Academy, a long-time resource that has offered significant help to the community, was saved. “As hard as it was to move, the end result was amazing,” Black said. McCoy Academy was named after the late Gladys McCoy, a former Multnomah County chairperson, school board member and the first African American elected to public office in Oregon.